Trump Wants a Military Parade — So What? There won't be a parade of tanks, troops and a flyover as part of Veterans Day celebrations in Washington this November. Pentagon officials announced the change of plans late yesterday, with President Trump Friday blaming a "ridiculously high" price tag on city officials. Director of Defense Press Operations Col. Rob Manning said late Thursday that the Pentagon and the administration will "explore opportunities in 2019," according to AP, and Trump tweeted twice about the parade being canceled, citing the cost. ....attend the big parade already scheduled at Andrews Air Force Base on a different date, & go to the Paris parade, celebrating the end of the War, on November 11th. Maybe we will do something next year in D.C. when the cost comes WAY DOWN. Now we can buy some more jet fighters! After reports circulated Thursday that estimated costs of a Veterans Day military parade in the nation's capital had risen to $92 million, Government Executive's Erich Wagner reported that some of Trump's requests, like tanks, would run afoul of an NDAA provision prohibiting "motorized vehicles." According to Just Security reporter and editor Kate Brannen, Chief of Staff and decorated veteran John Kelly was one of the first to balk at the new cost estimates on Thursday afternoon. I've been told that Kelly is "freaking out over the cost." According to CNBC, the estimated $92 million would have been split between $50 million from the Pentagon and $42 million from other agency partners like the Homeland Security Department. The money would cover transportation of troops, weapons and other "parade assets." CNBC also reported that the parade would showcase some of the military's storied past. The parade is also expected to include helicopter, fighter jet, transport aircraft as well as historical military plane flyovers. Troops in period uniforms representing the past, present and future forces will march in the parade, as well. 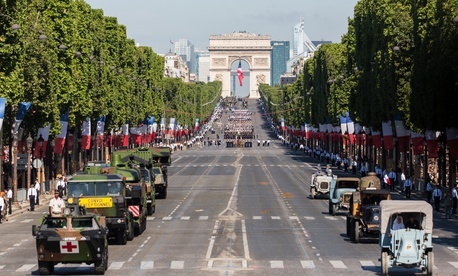 According to CNBC, Trump's interest in a military parade is said to be largely inspired by the president's front-row seat at France's Bastille Day military parade in Paris last year. Trump's reference in his Friday tweet seems to support this, as well as the series of photos released by the White House after the 2017 visit to France. "It was a tremendous day, and to a large extent because of what I witnessed, we may do something like that on July 4 in Washington down Pennsylvania Avenue," Trump said at the time.